Function is always applied to the original color image. Color Deconvolution is used to separate a color image into channels (colors) that are not the basic red, blue and green channels. 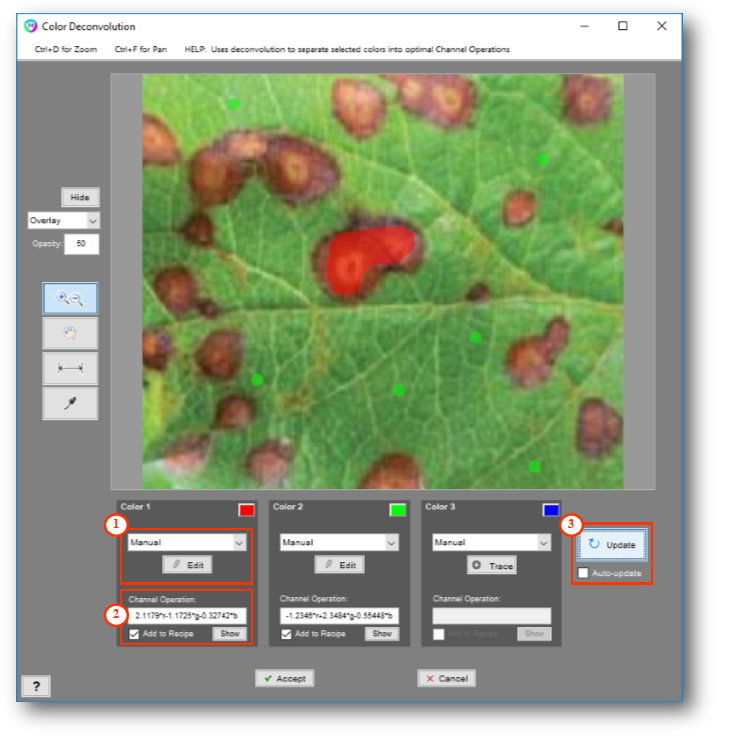 It is a powerful tool in pre-processing color images that generates grayscale channel operations that can be further filtered to select features of interest. Applications vary range from biomedical histology to mineral geology. Deconvolution works best on uncompressed file formats such as a TIFF. Select to manually outline the colors to be separated. Only option available at this time. Once the deconvolution is performed a channel operating is generated. Select Show to view the resulting grayscale image and check ‘Add to Recipe’ to automatically generated the channel operation in the Image Processor recipe. Once at least two of the color fields were selected, the image can be deconvoluted into channel operations which will appear under each color.